HomeSmartphonesAndroidWhat are 10 Common Challenges Most Android Developers Encounter? Which Social Media Marketing Tactics Bring e-commerce Sites Higher Traffic? Android app development companies India will tell you it’s brilliant working on open end platforms giving much freedom and creative room to explore. Being an absolutely open end platform with incredible support and a large consultable community helps many developer’s cracks the nitty-gritty of android app development. And as the android operating system accounts for more installs on digital devices around the globe, it connects developers to brilliant opportunity of incredible distribution platforms that enhance creation of potentially successful apps. But android development is filled with several missteps and challenges. These hurdles and frustrations facing android developers may temporarily impede faster application development. 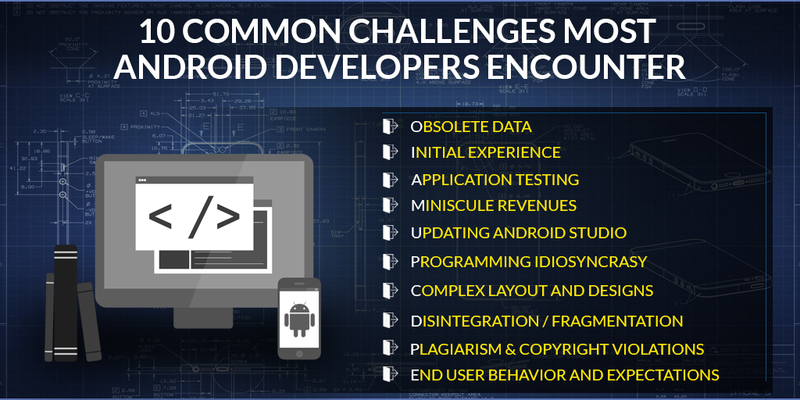 Challenges are many common to all developers that hamper android development. Initial experience in android development is frustrating including download of entity modules like (IDE, SDK, JDK), organizing paths, making virtual machines etc. All this takes time and is a slow pace. Sometimes, this is unnerving as it occupies huge space on hard drives. While testing on latest versions of Android, errors do occur which means spending considerable time checking ways to eliminate them entirely. This phase affects work speed and takes time to rectify. Testing on Android is frustrating because emulator in Android Studio is slow sometimes booting on old hardware is irritating. While testing on a physical device, you have to wait for its slow build time to terminate. It’s good Android is on many digital devices like tablets and phones. But creating apps and ensuring they look good for all users is challenge. It also hard when many users are still running old Android versions. Android Studio design is useful to a point and falls short in creating complex designs or layout. However, online sites show strategy of adding user interface elements in many configurations which underlines the issue. Many programming structures and processes are not clear. Threading is one as you cannot update UI elements from other threads. This means need for other solutions. View restoration is another and working with APIs is a hard task. Android programming data frustrations stem from uploading documentation obsolete. It’s good that Android constantly evolves including the territory. Google always changes its best practices and code is regularly depreciated. This alone is hard to keep up with and get vital support. It good to filter Google searches and display pages for year keeping you update. Sometimes, for android application development India, most users seem on Play Store dissatisfied. Bad reviews, angry emails full of incensed emotions for paid apps or simply asking outright why it’s not free, unrealistic demands about standard features to include. Sometimes nice and pleasant compliments are real treasure to read. Discovering apps available free to download on dubious websites after launch is a huge challenge for Android hurting several developers. 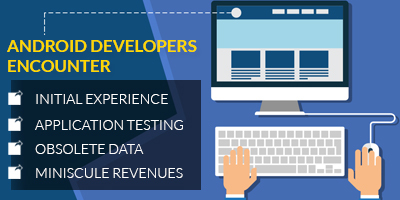 Though you tackle off issues ranging from install Android Studio, updates, solved layout editor and APIs, encountered bad reviews, overcome pirates and fragmentation there are still less profits overall. Android application solutions India provides ample and best benefits as well as secure grounds to launch.